Photo by Cathy Fuentes-Rohwer Michelle Smith, a Bloomington teacher, testifies before a nearly empty House Chamber on Monday. A legislative study committee examining the teacher shortage issue dragged on for hours before members of the general public were allowed to speak. 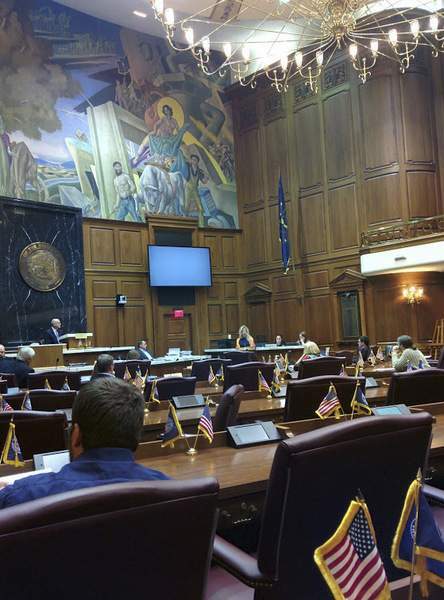 Indiana legislators pride themselves on their citizen-lawmaker status. They insist the professional expertise they bring as business owners, lawyers and more is preferable to the professional politicians serving in California, Michigan, Ohio and a handful of other states. But a hearing Monday demonstrated once again that some legislative leaders believe selected views are the only citizen input that matters. A nearly nine-hour study committee hearing on the teacher shortage issue was stacked to allow so-called expert testimony at the start, leaving parents, school board members and teachers to wait hours to address the handful of committee members left in the nearly empty House Chamber. Their disregard for the dozens of people who traveled to Indianapolis to speak shouldn’t be overlooked. Cathy Fuentes-Rohwer, a Bloomington parent and public education advocate, was the last to speak, about 8:40 p.m. Monday. She chided Sen. Dennis Kruse, the Auburn Republican who is chairman of the committee, and the few remaining legislators for giving preferential treatment to others, suggesting a separate session should have been held for those remarks. "There were passionate voices that should have been heard," Fuentes-Rohwer said of those who left without speaking. In prepared remarks, she pointed to policy shaped by the corporate-controlled American Legislative Exchange Council, as a reason for the teacher shortage in Indiana and elsewhere. She called out the committee’s vice chairman, Rep. Robert Behning, as a former ALEC state chairman. "The A-F grading of schools, teachers’ loss of voice in advocating for kids through the loss of collective bargaining, the draconian third-grade reading law, vouchers and charters creating a competition for funding, a developmentally inappropriate 90 minute block of literacy instruction, these are all ALEC laws," she told the legislators, "They were not backed by research of what are best practices in teaching. They were not created by teachers." Terry Springer, a retired Fort Wayne Community Schools teacher, attended the hearing not to testify but to observe and support other members of the Northeast Indiana Friends of Public Education. Five hours of expert testimony focused on supply and demand, she noted, "as if teachers are a commodity and as if education is an industry rather than an institution that is made up of and serves people – children to be exact." Springer and most of the others had to make the 21/2-hour drive back to Fort Wayne before they had the chance to speak. The first speakers were officials with Statehouse offices. It’s common practice, of course, for legislative hearings to leave "public comment" to the end. Many opponents of a controversial bill limiting development of solar energy weren’t allowed time to testify earlier this year. But a statewide issue affecting millions of students and professionals deserves a better airing than it was allowed. In the weeks ahead, many lawmakers will undoubtedly mail "questionnaires" that serve more to make a political point than to invite public input. They should serve as a reminder – along with the embarrassing spectacle of Monday’s hearing – that the only citizens some lawmakers care to hear from are themselves.